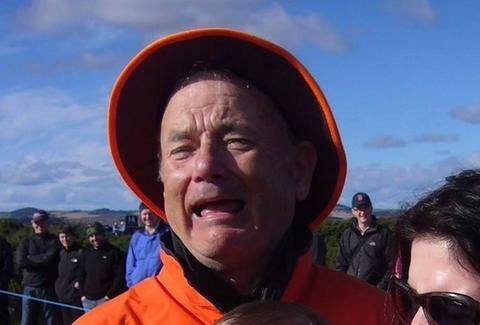 Is This a Picture of Bill Murray or Tom Hanks? The World Needs to Know. Just as “The Dress” transfixed the world and prompted wild discussion about perception and reality and who we really are as a people for far too long, there’s now a picture posing an even bigger dilemma for people of the internet: Is this a picture of Bill Murray or Tom Hanks? The moment you lay eyes on the photograph, Bill Murray’s whimsical old-man charm seeps from the screen, but as your eyes linger on the page, it clearly morphs into Tom Hanks sharing a cry with that baby. Look, we have reason to speculate largely here. Bill Murray is known for galavanting around the world and capitalizing on the element of surprise: He’s got a penchant for drifting into bars late at night, buying everyone a round, and even moonlighting behind the bar himself. He often vanishes before you can even snap a selfie with the guy. So why wouldn’t Bill Murray be holding this baby? Hanks, on the other hand, is a very public man (aside from being an internationally famous actor with nearly 100 professional acting credits to his name.) For prime examples, see his recent acts of goodwill and his propensity for photo-bombing newlyweds. The photo has been on the internet since 2013, cropping up occasionally from its original home on the Facebook group Reasons My Son Is Crying. It surfaced on Reddit yesterday, and now it’s confusing the hell out of everyone with ample time to ruminate on things this trivial confounding. So just who in the hell is in this photo? Ok, there is an actual answer, and in the interest of public decency, you can click here to find an answer to Murray-Hanks-Gate -- the latest digital quandary to go absolutely bonkers viral.